Sylvester Stallone burst onto the cinematic scene 40 years ago as the writer and star of a tender little film about a small-time fighter with a big heart who finds love, honor and self-respect while being beaten to a pulp in the ring. He goes the distance, and in doing so, he fulfills his dream. The budget ($1 million) was so low that stars Carl Weathers and Burgess Meredith shared a cramped dressing room and producers Robert Chartoff and Irwin Winkler had to mortgage their houses to come up with an additional $100 grand to complete the film, but it too went the distance. Rocky was the feel-good film of the year and won the Oscar for Best Picture. Stallone, who had been earning $36 a week as an usher while trying to make it as an actor, became the star of multiple action-film franchises from Rambo to The Expendables, but he eventually became more caricature than character. Rocky spawned six sequels over four decades that also became increasingly hollow imitations of the original. Until now. Creed, the latest entry in the franchise, manages to match the storytelling magic, cinematic quality, and emotional impact of Rocky by paying homage to the original without becoming a knockoff. In it, Adonis Johnson (Michael B. Jordan) is the abandoned love child of Apollo Creed (Carl Weathers), Rocky’s nemesis-turned-friend in the earlier films. Raised in foster care and group homes after his mother’s death, Adonis is a troubled kid with something to prove. Apollo’s widow (Phylicia Rashad) finds him and brings him into her home where he receives a good education and entry into a good job. But he still has something to prove, and he needs to do it in the ring. Adonis connects with a love interest similar to Rocky’s Adrian. Bianca (Tessa Thompson) is a professional singer who faces broken dreams too: she has a degenerative ear condition that is stealing her hearing. Yet she faces the loss with courage, optimism, and determination. She will not let the fear of her future loss destroy her enjoyment of what she has today. Bianca is no blossoming wallflower as Adrian was, but provides a strong, modern counterpoint to Adonis. 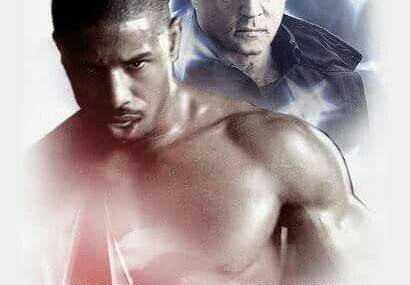 Creed is what a movie ought to be, and what the original Rocky was: a strong story with believable characters facing believable conflicts; music that supports rather than controls the emotion; and cinematography that captures the grit and reality of the story without cheap (or not-so-cheap) manipulation. Watcespecially for the two rounds of the boxing match that are captured in a single shot—no editing, no slo-mo, no cgi, just perfect choreography from actors, director, and steadicam operator Ben Semanoff. The film builds inexorably to the big fight, and it’s a doozy. The punches feel real and unrehearsed. But Creed really isn’t about boxing. It’s a story about ambition, disappointment, determination, and going the distance—about having a creed, and living by it. 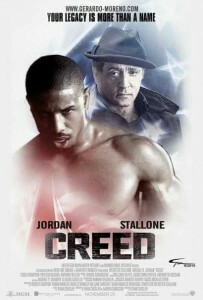 Creed, directed by Ryan Coogler. MGM, Warner Bros. New Line Cinema, 2015, 133 minutes.